SRA Home Products is proud to offer pergolas manufactured by TEMO to residents of West Chester, Pennsylvania. TEMO has remained a leader in the outdoor living industry since being founded more than 40 years ago, and the quality workmanship inherent in their products has helped them to achieve an A+ rating from the Better Business Bureau. Structural style — Our pergolas are available in three structural styles — attached, freestanding, and garden arbor — so you’ll be able to choose one that fits best into the layout of your backyard. Color — Our pergolas come in either white or sandstone, allowing you to pick one that will match the color of your home. Column style — You can choose which of our three column styles — Roma, Florentine, and Venetian — will best complement the architectural style of your home. 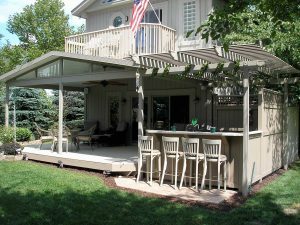 Our pergolas will stand the test of time — they are constructed using heavy-duty fully extruded aluminum, which is stronger than alternatives such as wood, vinyl, and roll-formed aluminum. They also include a resilient TEMKOR polymer coating that guards against scratches, dents, cracks, and more. Plus, they are protected by TEMO’s limited lifetime transferable warranty, which you can pass along to a new owner should you ever choose to sell your West Chester, PA, home. If you’re interested in having SRA Home Products install one of TEMO’s pergolas at your home in West Chester, PA, please call us today. Our knowledgeable team can further discuss your design options and answer any questions you may have about the installation process.